The Browns purchased the former bank building located at the corner of Plymouth Street and Central Avenue in downtown Le Mars, Iowa in August of 2015. “This has been a small dream for us for a long time,” says Shelly Brown. The family has been in the process of renovating the historic building which is rich in history into a small theater. They are refurbishing the building as much as they can. While renovating they discovered a seven foot marble wall in the front of the building actually ran the full length of the building! Tearing out the drop ceiling revealed a beautiful boxed ceiling with wood molding and hand stenciled design along the top of the walls. “We are trying to get everything back to the original look,” shared Shelly. The main floor will house the theater, with the second floor used as office space and a recording studio. The exterior of the building looks much the same as it did in 1915. In the basement of the building will be set up a gift shop and display of historic memorabilia from the building. Tours of the old bank vault will also be a highlight for visitors. 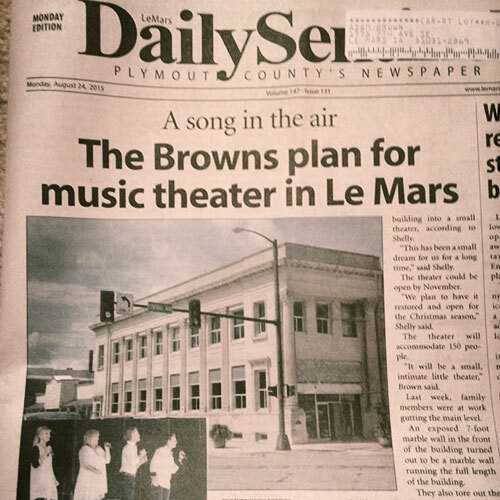 In 2015, after years as a bank and later a law office, music will flow from the stage of a small theater in the town of Le Mars, Iowa. The German-American Savings Bank is the successor to what was known as the Plymouth County Savings Bank & Trust Company, which was organized in 1883. The name was changed to German-American Savings Bank November 1, 1889. The steps to the bank building were built in effort to thwart would be robbers from riding in and making an obstacle to carry off their plunders. As our great nation went to war during World War II, “German” was dropped from the name thus renaming the bank The American Savings Bank. Our journey through renovating the theater.